How to educate your child to be open to all people and their culture is a tough one and for me ever more important given the world’s scary trajectory at the moment. I grew up in a Midsummer Murders type English Berkshire village. When I moved to London over ten years ago I went straight into a job in a Canary Wharf tower. I worked on a trading floor with 300 other people. Apart from having children this has probably been the most life changing and eye opening experience I’ve ever had. The people I worked with were from every nation imaginable including my own. Some practised religions you may and may not have heard of and some believed in none. Some were very traditional about their dress and customs and some were modern, westernised and incredible metrosexuals more groomed than half of us ladies. They were not all men and mostly attitudes towards women were gallant. My team, a long row of desks with men and women, became what we called our ‘aisle family’. You know that period you have in some jobs where you bond completely with a certain group of colleagues, no one joins or leaves the team for a year or two and the little group of you cement into this solid unit or family. I’ve had this two or three times in my life and it makes going in to work worthwhile because you just want to be with these brilliant human beings. In my first ‘aisle family’ experience there were a few white British people, a few British second generation Indians, a Greek, an Arab who was incredibly tall, stocky and scary looking with enormous eyebrows, (the kindest and gentlest person I’ve ever met) and many others. Because of this bond our differences became healthy topics of conversation and friendly banter not taboo areas of conversation to avoid. Growing up children are mostly discouraged from asking questions about others. We are worried they will offend someone. We aren’t sure of the right response. I learnt about Chinese New Year, Thanksgiving and Indian wedding customs. I found out why my Arab colleague couldn’t kill the fly in his office (It’s considered a sin) and why my Indian colleague was carrying his gym kit in a plastic bag (he thought a rucksack made him look like a suicide bomber and he didn’t want to scare people). On a lighter note I found out Americans put marshmallows on top of mash potato! Crazy lot! The more I understood about my colleagues’ reasons for their behaviour, traditions and customs the more fascinated I became by the world and the more I realised that despite these differences we are so very similar. We all want to give things in our lives meaning, whether through our religious beliefs, nostalgia from our upbringing, dates that we give special significance or simply the food we cook for our loved ones. Fast forward to now when I’m raising my own children. My Son at 4 years old has many friends of many nationalities, beliefs and religions, including British and Italian ones. This is down to him and whom he has naturally gravitated towards. So how do you educate about difference but without making an even bigger deal of it. At the moment I want my children to model good behaviour to everyone, everywhere because that’s just what involves being a decent person. I don’t want them to realise that quite significant adults are not modelling good behaviour when they should clearly know better. Although this is all a bit uncomfortable to deal with as parents, we do need to address it from an early age so they see difference as a positive thing and not something to be wary of. I do not have the answers to this complex issue but what I’ve found by chance as we are a family of mixed culture, (English & Italian) is that one of the easiest ways of introducing and creating interest in others is through educating about food, language and geography. I try always to use events such as Chinese New Year to cook a different food and make paper dragons. We talk about what languages are spoken and I get asked why I can’t speak Chinese! (Sorry I’m still trying to learn Daddy’s language!). At Thanksgiving I cook turkey and pumpkin pie. We find cartoon YouTube videos for children that describe why Thanksgiving is important and we look on our map and find America. At Christmas when my Son tells me his friend doesn’t celebrate Christmas I tell him to ask if he celebrates something else at another time of the year. Do they eat a certain food? What songs do they sing? I want them to ask because if they do it sensitively it builds understanding, a bridge and not a wall. I don’t believe we have to fear what is different, in-fact if we understand it we can embrace it. Lastly remember our children learn primarily from us, so talk to everyone at the pesky, cliquey school gates and your children will do too! Kristie is an English wife to an Italian husband and the mother of two little ones. Her mission is to raise her children to understand cross cultural life. 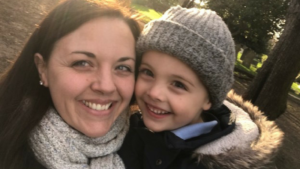 if you’re trying to teach your children a language, or if you want to hear how things are going with another procreator, good and bad then make sure you head over to Kristie’s blog – Mammaprada. She can also be found on Facebook, Twitter, and Instagram.